(Area NG 229 044) The remains of what may be a Cashel, or monastic settlement of Celtic type, exist at Sgor nam Ban-naomha (Skerry of the Holy Women). 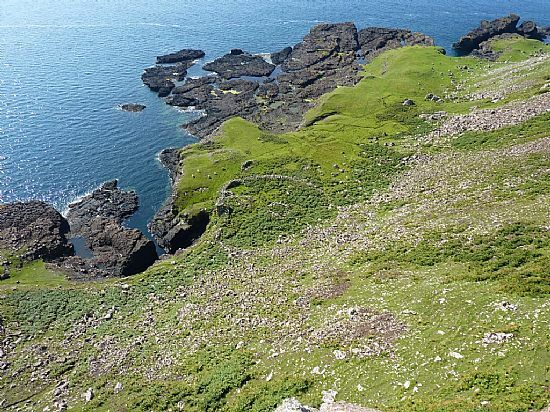 The site is isolated landward by an escarpment, and accessible from the sea only in fine weather. The construction comprises an enclosure (c.40 yards diameter) the drystone walling of which is 5ft thick, with a S (seaward) entrance. Within the enclosure, four structures are built against the outer wall, while three others are freestanding. Of these, only a well-house and mill have so far been determined. A D-shaped structure known as "The Altar" contains a low rectangular erection or 'cella' within which were found stone pounders and a fragment of a saddle quern. This 'altar' is shown, by RCAHMS, next to the mill, but Somerville (1899) describes it as forming the "centre of a large circle of stones about 100 yards in diameter", again in contrast to the RCAHMS plan which shows the enclosure to be c.40 yards diameter. 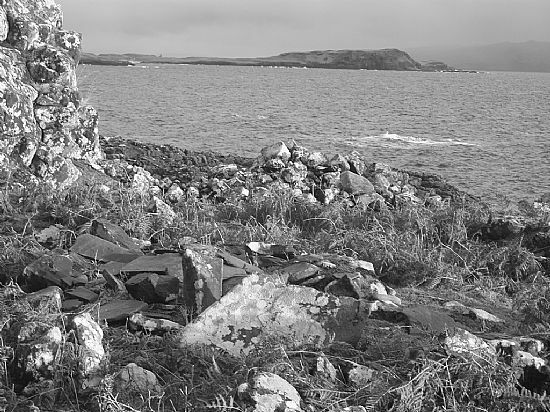 Somerville also mentions 8 or more small cairns concealed by bracken within the circle and around the Altar, but these may be the tumbled remains of buildings referred to by RCAHMS, but omitted by Somerville. J E Somerville 1899; RCAHMS 1928, visited 1925. A possibly 7th century eremitic monastery which has never been properly examined. A cashel at NG 2299 0433 at the foot of a cliff named Sgor nam Ban-naomha. The precinct wall averages 1.8m in thickness and encloses a sub-oval area measuring 39.0m N-S by 32.0m. Details of the entrance in the S are obscured by debris. 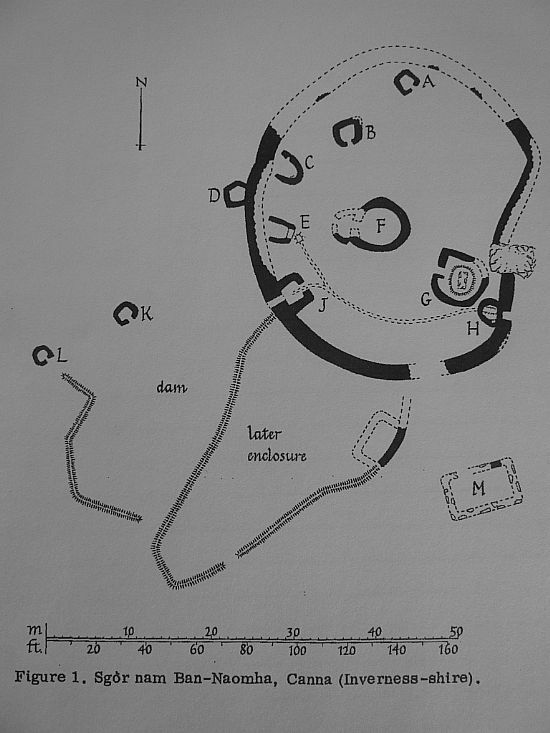 The main building in the interior ('A' on plan) is a strong dry built circular structure near the centre, stated by RCAHMS to be two-chambered. It measures 4.8m in diameter within a wall averaging 1.3m thick and surviving to a maximum height of 1.4m. The entrance seems to have been in the W where the wall has partially collapsed. Outside this entrance and built against the wall are the footings of a sub-circular annexe of much slighter construction, which may be secondary. It measures c.3.0m in diameter within a ruined wall spread to 1.5m. Structure 'B' is too ruinous to interpret its true plan, but its inner face appears to be circular giving an internal diameter of 4.8m within a wall about 1.0m thick. There is an ill-defined entrance in the W. In the interior is the alleged 'altar', a rectangular area 3.0m N-S by 2.2m formed by thin slabs on edge. A modern heap of debris occupies its centre. Abutting onto the SE arc of 'B' and built against the precinct wall, is the alleged mill ('C'), a roughly circular dry-built structure 1.9m in diameter within a wall 0.7m thick and c.1.0m high. There is no trace of an entrance. A stone-lined water course is exposed under the N half of the building. There would not seem to be a sufficient head of water to work a wheel, and there is doubt about the structure being a mill. The source of the water is in the vicinity of the alleged well-house ('D') which is a sub-rectangular building 2.0m x 1.2m internally. There is no trace of the basin of masonry inside it noted by RCAHMS. A recent excavation has shown that the external access to the well noted by RCAHMS and shown by them on their plan as a 'built well', is part of a stone-lined and lintelled conduit leading from the well-house to the mill. 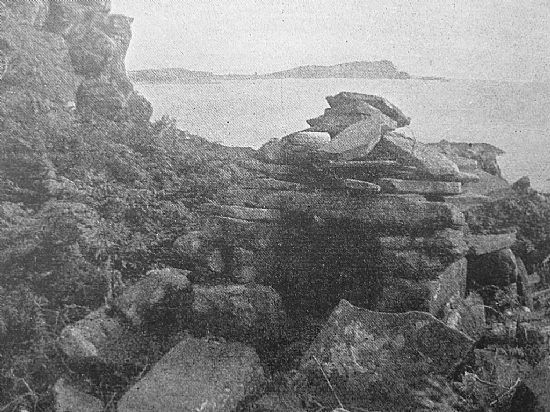 According to Campbell (Mr J L Campbell, Canna House) the excavation was made to clear out the conduit which was blocked. This used to be done frequently in 'the old days' by locals who revered the site. Another linear excavation about 4.0m S of the first has revealed what may be paving stones. Structure 'E', built against the inner face of the precinct wall, is roughly 2.5m square within a ruinous wall, with an ill-defined entrance in the NE side. There are traces of what may be a circular cell c.1.0m in diameter in the S corner. Immediately outside this structure, the base of the outer face of the precinct wall is pierced by a lintelled passage which can be seen leading E under the structure. This may be a drain. Structure 'F', utilising an outcrop as its NW arc, is oval measuring 1.9m x 1.5m within a ruinous wall 0.4m thick. This may be secondary. 'G' is probably later and may be contemporary with three similar structures (H to K) in the W at the foot of the scree outside the cashel; they look like recent animal pens. It is a roughly built enclosure with straight N and E sides and a curved SW side, measuring about 2.0m in diameter within a wall 0.4m thick and 1.1m high. The footings of two other roughly oval structures, one built against the inside face of the E arc of the precinct wall ('L') and the other outside ('M') are probably modern. About 15.0m S of the cashel, on a rise, are the footings of a rectangular building measuring about 6.8m ENE-WSW by 4.8m within a wall 0.9m thick. There are traces of an entrance half way along the N wall opposite to the entrance to the cashel. This is not the remains of a black-house, and could well be a church. Two ruinous walls of uncertain date spring from the S arc of the precinct wall and form two irregularly-shaped enclosures or parks. They may be secondary and contemporary with the 'animal pens' at the foot of the scree. There are fragments of other walls about 120.0m to the SW. The broken saddle quern is preserved at Canna House. Visited by OS (A A) 23 May 1972. This small enclosed site (a) is dramatically situated on a rock-bound coastal terrace below steep scree-slopes overhung by sheer basalt cliffs which rise to a height of about 90m. There is no convenient boat-landing, and the normal approach is from the NE by an eroded footpath which descends the screes. Although the place-name means 'cliff (or 'scree') of the holy women', the enclosure was probably of monastic origin. The oval enclosure measures about 37m from N to S by 31m within a massive drystone wall, up to 2m in thickness and 1.5m in height, which rises onto the slope to the N. At the centre there is a circular structure, 5m in diameter, and on the slope in the NW sector there are remains of small huts or platforms, perhaps the leaba crabhach or stone beds used by pilgrims seeking cures up to the 19th century (b). In the SE sector a D-shaped enclosure contains within a rectangular kerb a collection of rounded pebbles and loose slabs which appear to be the collapsed remains of a small hut known as 'the altar' (c). 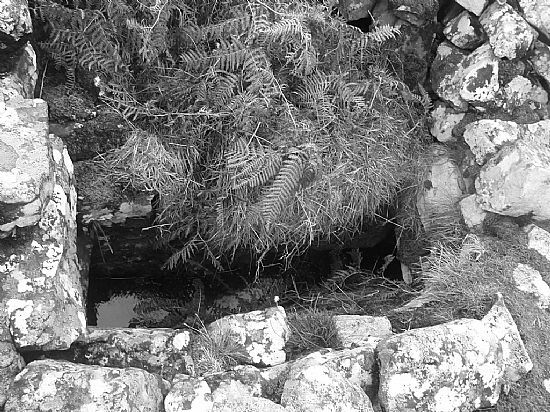 Outside the main enclosure to the W there were turf walls which channelled water through a lintelled opening in the W wall to serve a possible mill and a latrine, merging with the overflow from a well-house. The footings of a probable chapel, 6m by 4.5m and having a N doorway, are situated 11m S of the S entrance of the enclosure. The three carved stones described below were identified during the present survey in 1993-4, among the loose stones composing 'the altar'. They are now at Canna House. (1) Fragment of Torridonian sandstone, broken on all sides and measuring 0.25m by 0.13m and 35mm thick. The background is cut away to form a relief cross with curved armpits and a slight central depression, the shaft being flanked by rectangular panels. (RCAHMS 1995, 14; RCAHMS 1999d). (2) Irregular fragment of a cruciform stone of Torridonian sandstone, 0.24m by 0.26m and 25mm thick. The arms are broken except for one short and round-ended side-arm, but there are slight traces of the rounded armpit of the opposite arm. At the centre of one face there is a much-worn pecked equal-armed cross, 0.13m in span. (3) Two fragments of a rectangular slab of Torridonian sandstone. The larger fragment, which includes two worked edges, measures 0.38m by 0.27m and varies from 30mm to 40mm in thickness, the back being irregularly flaked and laminated. It bears the shallow grooves defining one side and the end of a cross-arm and part of one quadrant of its ring. The other fragment, broken on all sides and measuring only 105mm by 80mm, fits closely to the first and preserves traces of the opposite side of the cross-arm at the break-line, as well as the curve of the next quadrant of the ring. The cross-arm, which was about 85mm high, appears to have had a slight expansion at the outer angle of the defining groove (d). The ring was about 45mm wide and encloses a slight depression, but the form of the armpits is uncertain. It is possible that this was part of a recumbent graveslab, of the type found on Iona. (a) RCAHMS 1928, No.679; J G Dunbar and I Fisher 1974, 71-5; revised plan, 1994, in RCAHMS 1995, 14, and RCAHMS 1999d. (b) J E Somerville 1899, 133-40. (c) Ibid., fig.1 on p.134. (d) Cf. fragment at Iona (A4(34A)).